Versus Evil’s Like a Boss isn’t your typical RPG. 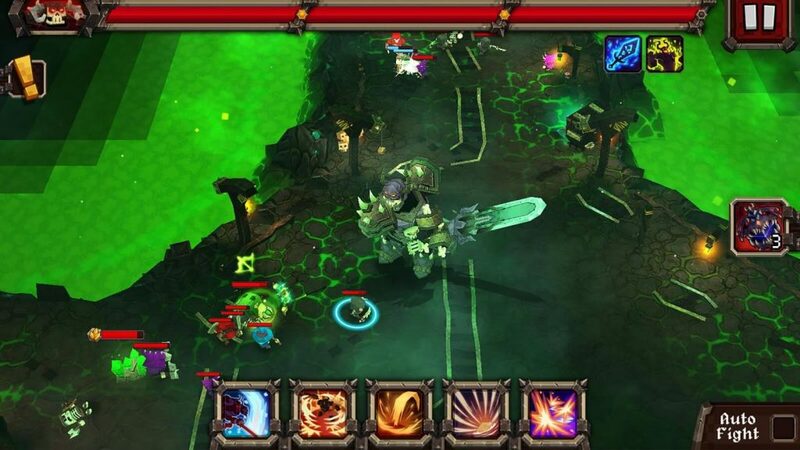 You won’t be choosing your favorite heroes, recruit mages/archers to your team and hack and slash monsters. Instead you will step into the world of evil, where giant vile bosses are pissed off at puny heroes for stealing their treasure chests and are waiting to teach them a lesson. You will play the role of one these boss monsters and command an army of minions as they will do anything to please their master, including going on raid missions to bring loot chests to their beloved boss. On your hero-slashing journey, you will collect various items, recipes and craft weapons and armor to make your character more powerful. Follow these quick tips and strategies to get more loot chests and item recipes. You will also know what’s the best way to increase your boss’ item level. The Warlord is actually a Warrior class and choosing this will allow you to equip large weapons that deal melee damage to heroes. You will also be able to equip shield that will pretty much complement with your main weapon. And if you want, you can also equip dual weapons to deal some extra damage to enemies. Executioner can also be called as Archer class. If you select this class, then your boss will deal ranged damage to enemies. You can equip a bow, crossbows or rifle to him and he can easily start attacking those puny heroes from a distance. All you have to do is tap on his enemies and he will do his job. Spellweaver is the Mage class and if you love RPGs, you would know what mages are known for. On choosing this class, you will be able to equip a staff wand or orb to your boss. Mage-type bosses can control the battlefield and can deal massive area damage to enemies using their magical weapons. It’s totally up to you to select a class of your choice, and surely it depends on your battle style. I chose Executioner as I could attack enemies from a fair distance while my minions would deal melee damage until heroes are dead. This made it easier for me to complete all objectives and chapters. Before playing a new chapter, note down the recommended item level. It shows the required “power” your boss needs to easily complete a chapter. If your boss character’s power level is below the recommended level in a particular chapter, then it might be a bit difficult for you to complete that chapter, although it’s not impossible to win. However, just to be on the safer side and complete all objectives effortlessly your boss’s item level should be above or at the same level. Now you must be wondering how to increase the item level. Well all you have to do is equip items to your boss. You will get these items from loot chests. You can also craft items and then equip them to increase item level. You can head straight to your inventory and equip items by dragging them to their respective slots. An empty slot will glow when you press an item in your inventory. Just make sure you don’t equip those that show a negative value beside your stats. You can clearly see stats decrease and a negative value shown in red when you drag an older item to an empty slot. You can sell such items for gold. Just like any other RPG, Like a Boss allows you to distribute skill points to learn/upgrade passive and active skills. You get skill points when your boss levels-up. Your boss will need XP to level-up. XP can be earned once you complete a mission. Once his XP bar fully fills up, you will get a skill point. When the game begins you will have one active skill and 4 passive skills unlocked for you. You can spend points to learn them. As your boss monster grows stronger, you will be able to unlock more active/passive skills. Spend points wisely. Along with allocating points to active skills, don’t forget to distribute points to all unlocked passive skills. In order to learn a passive skill, you will have to spend one point to it. A passive skill boosts stats and will work all the time, i.e. remain active all the time. For example: The first passive skill, called “Impetuous” increases your boss’s attack power rating while your health is above 70 percent. The second passive skill, called “Swift” increases your movement speed for a few seconds when you kill an enemy. So yes, these passive skills can be very helpful during your battle against heroes. Before allocating points, make sure you tap a skill to know more about it. Since the first few levels are easy to win, you can wait until you accumulate enough points and then distribute them evenly on all 4 starter passive skills to learn them. Later, you can upgrade these skills by allocating more points to them. Now that you finished a level, it’s time to send your minions back to the same level to show those heroes who the real boss is. Your minions will kill any enemies they spot and bring you loot chests, which may contain valuable minerals for crafting items, recipes and items. Now you won’t be able to see the action but will receive any loot instantly. Raid missions are only available for completed levels and cost energy. The only drawback is that you will earn fewer coins and XP if you send your minions. However, you will receive chests instantly and these chests may also contain a rare item. You can raid a particular level more than once, but the more you raid, the more energy you will spend. If you don’t want to send your minions, you can personally replay the same level. You will surely get more coins and XP if you play the same level again as opposed to sending minions to kill enemies. Like a Boss not only lets you socialize by adding Facebook friends and random players to your player account, but also rewards you in doing this. Adding friends gives you extra XP and gold for each completed level. For example: If 3 players have accepted your friend request, then you will get 5 percent extra gold from all sources. Your friends will get extra XP as they have also added a friend (you). Tap the “Friends” icon to add buddies. You can add them by searching their name on the search box or connect to Facebook. So you want to craft a deadly weapon or snazzy boots that will increase movement speed? Well, you will first need the recipe of that particular item. You will have to collect pieces of that recipe before you can start crafting it. You can get recipe pieces from loot chests after completing a level. Don’t forget to send your minions to raid completed chapters to get more loot. This will help you get more recipe pieces. Before starting a level, make sure you check the “Show recipe progression” box which is located just below the “Possible Loot” section. This will let you know whether you have collected the full recipe set. While collecting pieces of recipes from a level, you will notice the progress bar and if it is full, you are ready to unlock and craft it. Just head straight to the Crafting section, tap that item and then press the “Create” button to unlock it. You will then have to use minerals to craft that item and only then you can equip it to your character. You can get minerals from loot chests. Make sure you select the correct class before choosing an item on the “Craft” screen. You cannot unlock and craft an item that belongs to a different class. Tap the “Craft” icon (hammer) and then tap a locked item. A new window will open showing information about that item, including key stat modifications after it has been equipped to your boss. Beside stats modifications is the list of chapters where you can find recipe fragments of that item. If that chapter is unlocked and you have played it before then a play icon will appear beside it. Tap it and replay it to get remaining recipe pieces or send your minions to collect loot chests.